Find Local companies rated Highest in Quality and Helpful Expertise. Performance Guaranteed. Diamond Certified Companies are Rated Highest in Quality and Helpful Expertise. Why this rating is the most accurate. Our editors gather deep company info. Electrical work tends to concern homeowners more than many other types of home repairs. That’s understandable since electricity can pose serious safety hazards for you and your loved ones if the job isn’t done right. That’s why it’s important to hire an experienced, licensed electrical contractor in Napa County who knows how to install and repair electrical systems to code. Expert electricians in Napa County can accurately diagnose problems, including those with faulty home wiring, electrical systems, overloaded circuits and electrical panels. They’ll can also help you navigate your options for electrical repairs, home rewiring, new electric installations and other necessary repairs and electrical installation services. 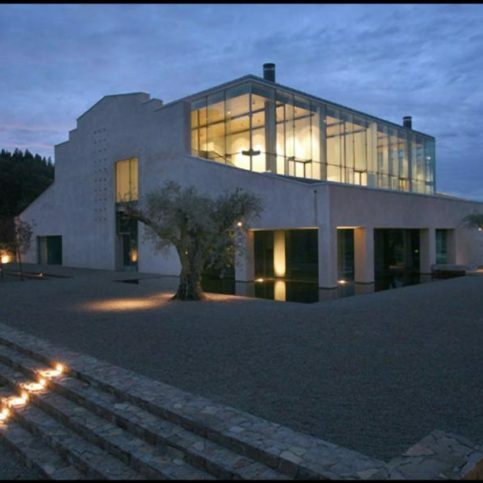 Researching your options will make it possible for you to find the electrical contracting firm that best fits your needs among those in Napa, Yountville, Calistoga, St. Helena, Deer Park, American Canyon or your area. Electrical emergencies and large electrical installation projects aren’t good times to try out new electricians. So it’s wise to interview and hire a Napa County electrician for a few small jobs before you need them for a last-minute fix or major project. That way, you’ll be able to see the quality of work and level of service your contractor provides without a large commitment. When electrical problems arise or when you’re planning a large rewiring project or home addition, you’ll have confidence calling that electrician back again to do a larger, more in-depth job. Keep in mind that cost shouldn’t be the deciding factor in which electrician you choose, unless all the other factors are equal. An electric contractor’s experience, skill, the quality of materials and ability to work to code are far more important than hourly rates. Higher quality electricians in Napa County and the Bay Area may charge more for their services at the outset, but their experience may allow them to finish the jobs faster, complete them with more accuracy and provide a safer and more attractive installation and repair than less experienced electric services. Why Trust Diamond Certified Electricians Rated Highest in Quality? 1) Accuracy: All research is performed by live telephone interviews that verify only real customers are surveyed, so you’ll never be fooled by fake reviews. 2) Statistical Reliability: A large random sample of past customers is surveyed on an ongoing basis so the research results you see truly reflect a Diamond Certified company’s top-rated status. 3) Full Disclosure: By clicking the name of a company above you’ll see the exact rating results in charts and read verbatim survey responses as well as researched articles on each qualified company. 4) Guaranteed: Your purchase is backed up with mediation and the Diamond Certified Performance Guarantee, so you can choose with confidence. Click on the name of a Diamond Certified company above to read ratings results, researched articles and verbatim customer survey responses to help you make an informed decision. More than 200,000 customers of local companies have been interviewed in live telephone calls, and only companies that score Highest in Quality in customer satisfaction–a 90+ on a 100 scale–as well as pass all of the credential-based ratings earn Diamond Certified. By requiring such a high score to qualify, the Diamond Certified program eliminates mediocre and poorly performing companies. 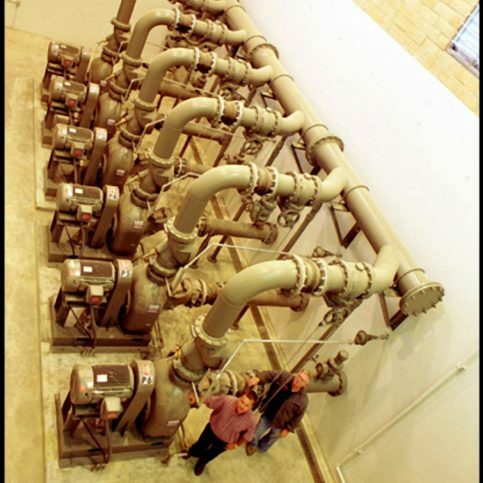 Read detailed information about the ratings and certification process. Barbara Ragsdale is a 40-year veteran of the electrical industry and president of Knights’ Electric, Inc., a Diamond Certified company since 2002. She can be reached at (707) 726-2909 or by email. WINDSOR — When asked how she became president of one of the North Bay’s premier electrical companies, Barbara Ragsdale describes it as an organic progression. “My parents started Knights’ Electric, Inc. in 1976, and I guess you could say I kind of grew into it,” she says. “I started by picking up materials at the wholesale house in Santa Rosa after school and driving them back to the shop in Windsor.” Following high school, Barbara served as secretary-treasurer for the company until 2006, when she took over ownership from her father, Bob Knight. Outside of work, Barbara engages in a variety of creative hobbies that include knitting, baking and various home improvement projects. While she likes being at home, she says she appreciates the outdoors as well. “We like to ride our scooters to the Town Green, as well as take camping trips to areas like Hendy Woods and Van Damme State Park.” Barbara also enjoys assisting her husband with recreational beekeeping and keeping up with her son, Zach, who is currently serving in the U.S. Navy. Barbara also stays actively involved in her community, both in a professional and personal capacity. In addition to having previously served as president of the Redwood Empire Independent Electrical Contractors and the Windsor Boys & Girls Club, in 2009, Barbara became the second female ever to serve as president of the North Coast Builders Exchange. Q: If you could visit anywhere in the world, where would you go? A: I’d like to see the British Isles. Q: Are you a dog person or a cat person? A: Definitely a dog person. My dog, Coco, comes to work with me every day. 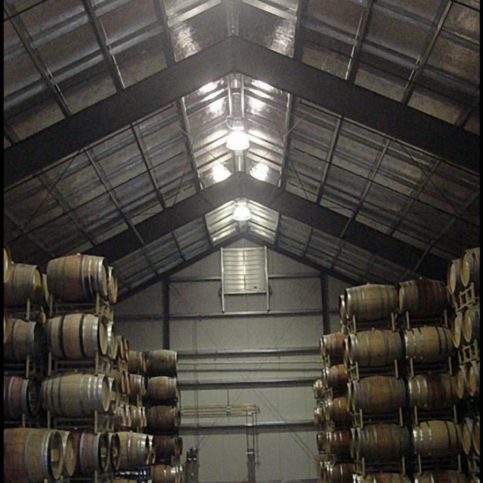 Q: Do you have a favorite Bay Area winery? A: Dutcher Crossing Winery in Healdsburg. Q: What’s your favorite thing to do on a rainy day? A: Bake, read and knit. Q: What’s the best gift you’ve ever received? Q: What’s your favorite dessert? 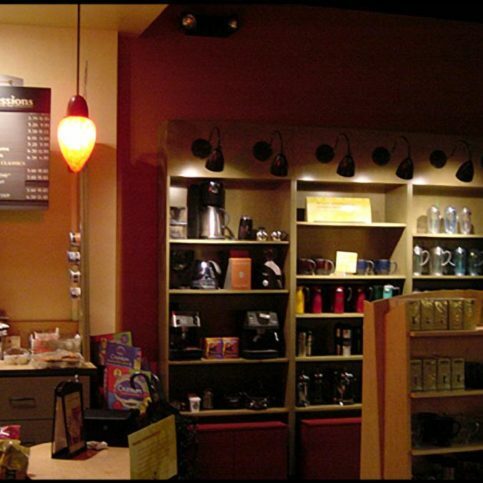 KnightsÛª Electric installed this product lighting at a local Starbucks. 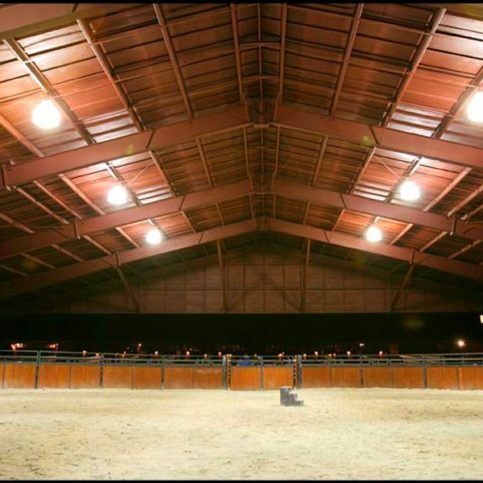 KnightsÛª Electric installed this arena lighting. A KnightsÛª Electric technician checks some infrastructure wiring. KnightsÛª Electric recently completed the electrical work on this mixed-use complex with arts-related offices in Geyserville. 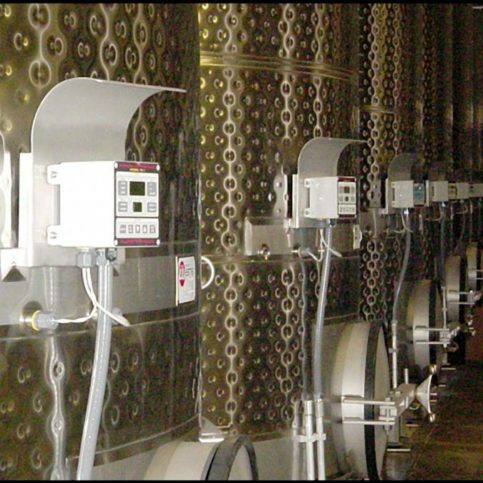 KnightsÛª Electric installed these winery tank thermostats. 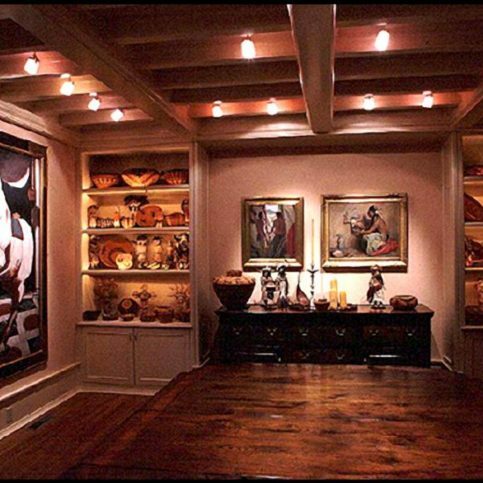 KnightsÛª Electric installed this lighting to highlight the clientÛªs artwork. A KnightsÛª Electric technician works on a generator. KnightsÛª Electric installed the landscape lighting on this mixed-use complex in Geyserville. KnightsÛª Electric takes on industrial electrical work. 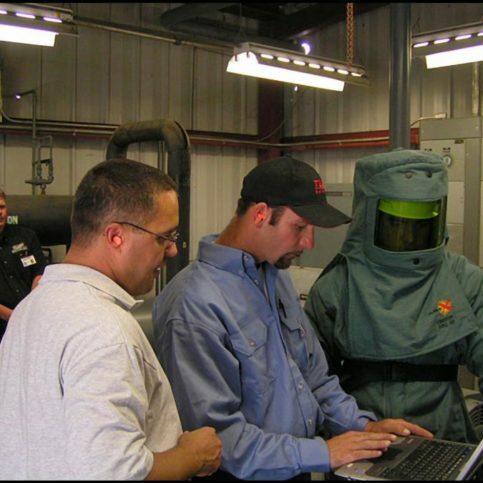 KnightsÛª Electric technicians take part in energized maintenance training. Following consumer agencies and trade associations have additional information about choosing, hiring and dealing with local electrical contractors. When beginning your search for a good electrician, start by asking yourself a few basic questions about the work you need done and the type of contractor you want to hire. Write down your answers as having specific goals can help you present a coordinated case to the companies you interview. Do I want a Diamond Certified electrical contractor that is rated highest in quality and backed by the Diamond Certified Performance Guarantee? What services do I need (electrical repairs, home rewiring, commercial electrician services, new construction electrical work)? What is my budget for my home electrical installation or electrical repairs? Once you’ve interviewed some electricians over the phone, pick the best two or three and invite them to come to your home or business to see the electrical installation job you’re considering or the electrical repairs you need. This will give them a chance to see the work in person to give a more accurate estimate, and it will also give you a chance to meet with them one-on-one to confirm that you are able to work with them on a business transaction. How long will the electrical work take? Will I be able to stay in my home during the rewiring? Or will the electricity be shut off for too long for me to remain comfortably in my home? Have you completed similar electrical work in my area of Napa County? Do you have a list of recent customer references that I can call? How do you finish your electrical installations and repairs? Is it possible for you to return my home to the condition it was in before you did the work, or will I need to hire another contractor to repair walls, paint or other areas? How should I handle future electrical service issues? Will you be responsible for warranty work if there’s ever a problem with my new electrical wiring and fixtures? Is there anything I can do to make the electrical repairs and installation process go smoother? It’s best to choose a Diamond Certified electric contractor because all certified companies have passed an in-depth ratings process that most other companies can’t pass. If you want quality from an electrician in Napa County and the greater Bay Area, you can have confidence choosing a Diamond Certified company. Diamond Certified reports are available online for all certified companies. And you’ll never be fooled by fake reviews. That’s because all research is performed in live telephone interviews of actual customers. If you can’t find a Diamond Certified electrician within reach, you’ll have to do some research on your own. If you do, it’s wise to call some references provided by your contractor. Keep in mind, though, that references provided to you by electricians are not equal in value to the large random sample of customers surveyed during the Diamond Certified ratings process. That’s because references given to customers from companies are cherry-picked instead of randomly selected from all their customers. So the contractors will likely give you a few customers to call that they know are satisfied. If you do call references on your own, specifically ask for a list of the company’s 10 most recent customers in Napa, American Canyon, Rutherford, Livermore, Calistoga, Angwin, Oakville, St. Helena or your area. This will help avoid them giving you the names of only customers they know were satisfied. Were you satisfied with the service from _(electrical company name)_? What was the type and scope of job they did for you (emergency electrical repairs, electrical rewiring, lighting installation, fuse replacement, electrical panel service, etc.)? Were they prompt and personable? Did the electrician explain to you the status of the work? Did this electrical contractor complete the work on time? Were there unexpected costs associated with this electrical service? If so, what were they for and were they avoidable? 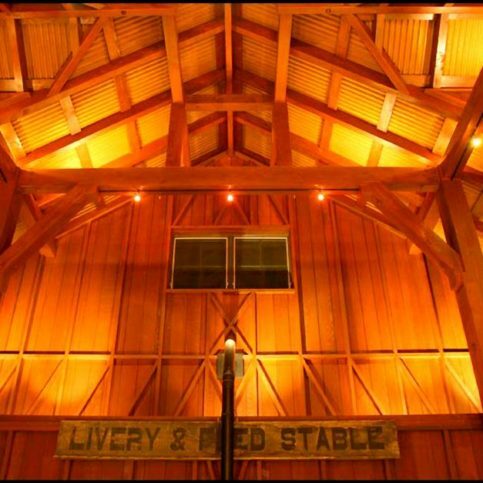 Did the electricians charge extra to travel to your home if you live in a smaller Napa County town or rural area? Did the electrical contractors clean up after finishing the job? Would you recommend their services to friends or family? When you need electrical service in the future, will you hire this company again? The Diamond Certified symbol has been awarded to companies that scored Highest in Quality in an accurate ratings process. 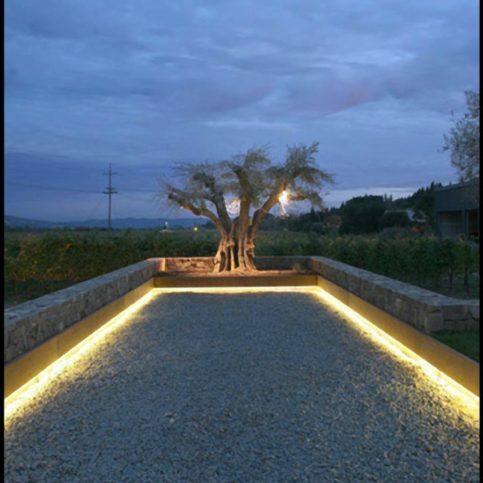 There are many good electrical contractors in the major cities of Napa, Calistoga, American Canyon, St. Helena and Yountville. Hiring a professional who does quality work and has experience in the services you need can mean a better chance of getting the results you desire. Before deciding on the best electrical contractor for you, mull over the following questions. Is there an electrical contracting company on your list that can meet your needs for electric services, supplies and materials, brands and installation or repair requirements? Are the Napa County electricians knowledgeable about the repairs and new electrical wiring you need? Can they easily explain to you which products and brands best fit your needs? Is the contractor sensitive to your budget? Can they give you varying bids that address your resources? Do the electricians guarantee their work and offer warranties on their products? Some individuals like to establish a relationship with their electrician by hiring them for smaller projects before calling them for emergencies and large electrical installation projects. But just like homeowners can be choosy about with whom they do business, many contractors are interested in providing services to those who are reliable, fair and honest. Bids can be expensive to prepare and no contractor wants to waste time bidding a job that homeowners aren’t serious about finishing. How can you be the kind of homeowner that the best electricians want to work with? See the tips below. Prove your interest in value over low cost. Many people start their discussion with contractors by asking simply about price, not value. You can show your interest in quality by asking questions about products, repair methods, installation techniques, warrantees and lasting value rather than simply price. Be upfront with the electrical contractors that you’re interviewing if you’re accepting multiple bids. But only shop among carefully-selected electrical companies that offer quality work and don’t accept more than three bids. Tell your electrician exactly what you want done and every specific direction or request you have. This will allow them to give you the most accurate bid possible and gives them insight into exactly what you want from your contractors. If they can’t provide what you need or want, it’s better to find out before you’ve wasted your time and theirs. Interview and choose among local electricians in Napa County. Most electricians prefer to work within a smaller radius, as this allows them to provide faster service and reliable emergency repairs. Now that you’ve found the electrician that best suits your needs, you can move forward and sign a contract. Good contracts should include details about the scope of the electrical work, any materials and products to be used, payment terms, the expected timeline for the job and any warranties and guarantees that will cover the work. Your electrician should provide the contract to you and allow you to read through it and ask any questions you may have before signing the contract. This agreement protects you, your property and the contractor, so it’s important that you understand all terms and exclusions and that you never sign an incomplete or blank estimate or contract. If there are items you verbally agreed upon with your electrical contractor, you may write in those terms. These may include specific expectations and instructions, expected start and end dates, clauses that stipulate when the work must be completed, and any bonuses or offers you wish to extend for early completion of the work. There are a few things you can do before your electrician arrives and while they’re working in your home or business in order to help the work move along more smoothly. Have a list of specific repairs or electrical installation work you need done, and write down any questions or concerns. This will ensure you get the service and answers you need and can possibly cut down on the length of time the job takes, reducing billable hours. Clear unnecessary items from the area where the contractor will be working. For example, if your electrician will be repairing or installing a new electrical panel, make sure he or she has easy access to the existing panel by moving furniture or other objects that are in the way. This will cut down on the amount of time your contractor has to spend clearing the area in which they’re working. Keep pets and children out of the area while the work is ongoing. For larger projects that take more than one day, such as house rewiring, your electrician may have to leave wires exposed or walls opened. In this case, keep family members and pets out of the room until the work is completed. Talk with your electrical contractor about the duration of the job and his or her preferences. Ask your electrician or electrical company representative what you can do to help speed the job along or make the work easier. There may be simple steps you can take to increase the contractors’ efficiency, thereby cutting down on the amount of time spent and the overall cost of the job. How Can You Be a Good Electric Contractor Customer? It’s the electrician’s responsibility put in quality wiring and electrical fixtures using the best possible installation techniques. But you play a big part in the success of your electric services, too. Here are a few simple steps you can take to be a good customer when hiring a Napa County electrical company. Be honest and clear with the electricians you hire. Let them know what type of electrical services you want, the long-term outcome you’re expecting and specific ways they can satisfy your expectations. Remember, a friendly smile and good attitude goes a long way. Before you hire a contractor, restate your expectations and goals, and reiterate to the company representative your understanding of the agreement. Most problems with local electrical contractors occur because of a breakdown in communication. By being clear about your expectations and theirs, you can avoid most conflicts. Ask your electric contractor if you should call to check on the progress or if he will call you with updates. Be sure your service representative has a phone number where they can reach you at all times. The electrical work will move along more smoothly if the electricians can reach you for with updates, questions and authorizations. When your electrician contractor contacts you, return calls promptly to keep the job on schedule. Pay for the electrical work promptly. Why would you want to be a good customer? Local electricians appreciate customers who are straightforward, honest and easy to work with. Your good customer behavior sets the tone from your end and creates an environment conducive to a good relationship. When your electrical services are complete, ask your electrician to give you an invoice and walk you through the work before they leave your home or business. The electrical contractor’s name, business address and license number. An itemized list of all electrical work performed. A complete list of all electrical supplies used, including new parts and replacement parts. The total cost of the job, broken down into amounts due for electrical parts, wiring and for labor. Any applicable guarantees and warrantees provided by the electrical equipment manufacturers and the installers. Use the information on the invoice to compare against the work that was actually completed. If items don’t match up or you have questions about what was done, ask your electrician before they leave the property. During your walk-through, ask about any special instructions for operating or maintaining your new electrical installations or electrical fixtures. Not every electrical contracting company guarantees their work, but those that do should give you a written warranty as proof of their promise to back up their installations and electrical system repairs. Having a written warranty will help you understand the responsibilities of both you and your contractor if you need to place a warranty claim, and it will help protect you in the event of a discrepancy between the services you expect and those you are given. The electrician’s mane, business address and state license number. Details about what electrical products and work are covered and how the contractor will deal with warranty claims (full refunds, replacement or repair of faulty wiring, etc.). Expectations for customer responsibility when filing a warranty claim (i.e., paying a prorated amount, paying for labor costs, covering the cost of new materials and fixtures, etc.). The exact terms and limitations of the warrantee, including if it’s transferable to the new owner if you sell your home. All exclusions to the guarantees must be in writing and presented at the same time as the warranties. There are many electrical services required of electricians in Napa County, including in the major cities of Napa, Rutherford, American Canyon, Pope Valley, St. Helena, Oakville, Calistoga, Angwin, Deer Park, Yountville. The following are some of the most common electrical repairs and installation requests. Electrical wiring is a system of insulated wires that carry electricity from the electrical source to outlets and fixtures in homes and buildings. Sometimes referred to as building wiring, electrical wiring and rewiring services. Wiring for new outlets and outlet wiring replacement is very common. Many homeowners believe they can install new outlets, test for outlet wiring problems or install switch boxes, but even these minor electrical repairs are best left to professionals. Outlet wiring is a fairly simple procedure that will take most electrical contractors just a short time. However, outlets that are wired incorrectly can cause electrical shocks and even fires, so it’s imperative that you hire a good electrician to do your electrical work. Ceiling fans can reduce your heating and cooling bills and keep your house more comfortable year round. Ceiling fan installation is a common procedure that can be quick or require rewiring, depending on the desired location. Before calling a Napa County electrician to install your new ceiling fan, know where you’d like the fan located and whether you want a ceiling fan with a light. You may even want to purchase a new ceiling fan for installation. Most residential electrical wiring and new home wiring projects require strict adherence to local codes. Your electrician will most likely need to pull a permit for wiring due to the potentially dangerous nature of the work, so make sure you consult your contractor. New home wiring can be done to replace old wiring, faulty wiring or frayed wiring. It can also be installed as home wiring upgrades. New construction electrical services are those wiring and electrical system installation services for new buildings, including new homes, commercial buildings and industrial facilities. These wiring services are provided while the buildings are still in frame-up stages rather than after the walls have been put up. Electrical supplies include wires, cables, circuit breakers, switches, light fixtures, electrical boxes, tools and other supplies needed to install and repair residential electrical systems. All new electrical installations and many electrical repairs are required to pass an electrical inspection. Most residential electrical permits require three inspections. One during the early stages, one mid-way through the work and a final inspection. Your electrical contractor may be responsible for calling for inspections, so verify with them who will take on this aspect of your home electrical installation project. This inspection verifies that all work is done correctly, safely and according to local electrical codes in Napa County. Common electrical repairs in Napa County include wall switch troubleshooting, electrical rewiring and electrical wiring repair, circuit breaker troubleshooting, ceiling light fixture repair / replacement and electrical outlet repair. Safe and legal electrical repairs must be done by a licensed, insured electrical contractor who is in good standing with the state. Frayed wiring, faulty wiring and old home wiring may need to be repaired. 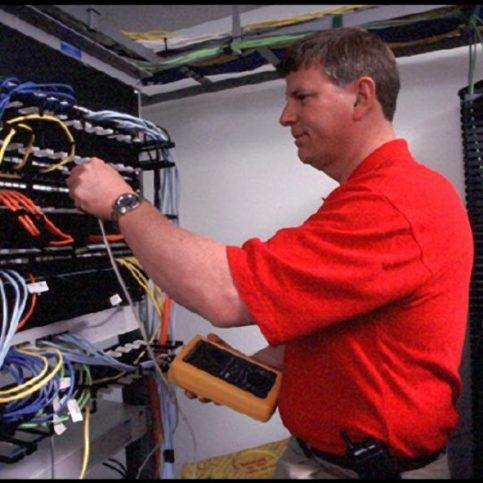 When wiring replacement or rewiring isn’t required, a simple home wiring repair may be possible. Your Napa County electrical contractor will repair existing wiring to make it safer and more reliable. Accent lighting is a decorative lighting source that provides variable degrees of light and may distribute light in multiple directions to emphasize décor or home and yard features. Common accent lighting methods include recessed lighting, track lighting and wall-mounted picture lighting. An electric current that changes direction with regular frequency is known as alternating current, or AC power. Most home and business power is in the form of ac or alternating current. The unit that measures the rate of flow of electric current. The use of one Ampere for one hour. The standard unit for measuring heat energy. One BTU is the amount of energy necessary to raise the temperature of one pound of water one degree Fahrenheit. Commercial lighting services include repair, installation and rewiring for commercial buildings. Commercial accent lighting, ceiling lighting, wall lights, outdoor lighting and emergency lighting are common types of commercial lighting. A type of fluorescent light bulb suited for use in homes and businesses. CFLs are known as energy efficient bulbs that fit into most existing light fixtures created for traditional incandescent light bulbs. Direct current is an electric charge that flows in one direction only. Fluorescent bulbs produce light by passing electricity through a gas, usually mercury vapor, which causes the gas to glow and produce ultraviolet light. Fluorescent lamps produce less heat than incandescent lamps and are more energy efficient. Fluorescent tube lamps have long been used in homes and businesses. Compact fluorescent light bulbs are becoming more common and replacing incandescent light bulbs in homes and commercial uses. 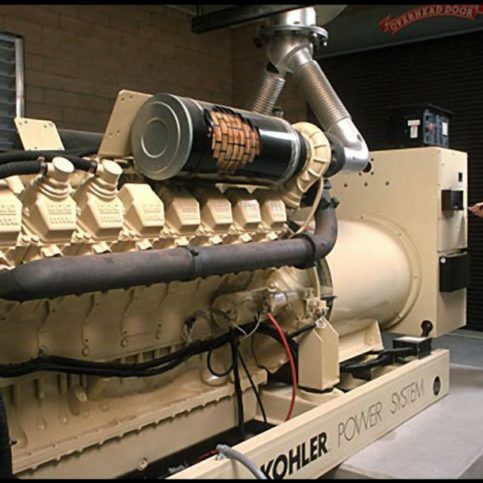 An electrical generator converts mechanical energy into electrical energy. Generators are typically used as secondary and emergency power sources in the event of power failures. A conducting connection between electrical circuits/equipment and the ground, or to some conducting material or surface that takes the place of the ground. Ground wires can be intentional or accidental. Intentional ground wires may be set in order to prevent contact with dangerous voltage and to keep static electricity from building. An electrical system or electric cable that operates between 46 kilovolts and 230 kilovolts. Incandescent light bulbs produce light by heating a metal filament wire, which glows brightly when it becomes hot. The hot filament wire is encapsulated within a glass bulb filled with gas. Incandescent bulbs were the most common light bulbs used in homes and businesses, but are being replaced with more energy-efficient CFL bulbs. An inverter is a device designed to convert direct current into alternating current of any required voltage and frequency. Inverters are commonly used to take power from fuel cells, solar panels and batteries and turn it into usable AC electricity for homes and businesses. A unit of electricity that equals 1,000 volts. A kilowatt equals 1,000 watts. An electrical system that provides power to electronic devices that operate on a voltage level lower than the standard 110 volts. Low voltage devices include doorbells, low-voltage lighting and thermostats. Guidelines for safeguarding people and property from potential electrical hazards. Electricians who comply with the National Electrical Code can install electrical systems that are essentially free from hazards. The N was first instituted in 1897 and is regularly updated. Photovoltaic systems, including solar panels and converters are used to turn sunlight into energy that can be used in homes and businesses. Residential electrical systems found in single-family homes, town houses, small apartment buildings and other residential structures. Electric systems in which the voltage exceeds 800,000 volts. A unit of electrical force. A watt is a measurement of power that is equal to one joule per second. Watts are broken into submultiples and multiples, including fetowatt, picowatt, nanowatt, microwatt, nilliwatt, kilowatt, megawatt, gigawatt, terawatt and petawatt. The power of one watt operating for one hour. A network of wire, conductors and devices that conduct electricity throughout a building or home to provide electricity. Q: Why choose a Diamond Certified electrician? A: Diamond Certified helps you choose an electrical contractor with confidence by offering a list of top-rated local companies who have passed the country’s most in-depth rating process. Only contractors rated Highest in Quality earn the prestigious Diamond Certified award. Most companies can’t pass the ratings. American Ratings Corporation also monitors every Diamond Certified company with ongoing research and ratings. And your purchase is backed by the Diamond Certified Performance Guarantee. So you’ll feel confident choosing a Diamond Certified company. Q: Can I do home electrical work myself? A: Any kind of home improvement project poses risks to homeowners who are trying to do it themselves. But none carry such a great risk as electrical work. Inexperienced people should never try to install electrical wiring or repair electric systems. Instead, all work should be performed by a licensed, experienced electrical contractor. That’s because professional electricians are trained in safety and code requirements, they’re better equipped with the correct tools and materials to complete the job, and they have the skills and experience to complete the job efficiently. Q: When should I call an electrician about maintaining or upgrading my home’s electrical system? A: It might be time to call a local electrical contractor if you frequently blow circuits or fuses, your lights dim when you turn on your air conditioner or other appliances, your lights flicker or go off and on, you smell electrical burning/wires or fuses smell hot, you use multi-plug power strips because you don’t have enough outlets, you use two-pronged adapters with three-pronged plugs or you often use extension cords. Q: What do electrical repairs and installation cost? A: Some contractors give hourly rates or per-project costs over the phone, but many decline to give estimates over the phone without seeing the project first. That’s because many jobs aren’t as simple as they may appear and homeowners may not be able to accurately describe the problem over the phone. Good electricians often want to see the electrical system themselves before they go on record with a price, because they don’t want to give inaccurate estimates. Q: What should I do if my power goes out? A: If the power is out throughout your home, check with a neighbor to see if they have power. If they are experiencing a power outage, call your utility company to report the problem. If the power outage seems to be affecting only you, call your electric company and ask them to send a representative to check your power supply. If you still are experiencing a problem, if the power company is unwilling or unable to send a representative, or the power is only out in one area of your home, call a local electrician to investigate the cause. Q: Does all home electrical work require a permit? A: General residential electrical services don’t usually require a permit, but large projects such as additions, basement and attic finishing and garage conversions may require permits and inspections. If you fail to get proper permits and the work doesn’t meet electrical and building codes, you could be required to redo the work at additional expense. Q: Will I be without power while my electrician is working? A: Depending on the job you’re having done, your contractor may not have to turn off the power to your entire home. In some cases, they’re able to cut off single circuits for a short time. Larger projects and repairs may require a total shut-off, but most good electricians minimize the amount of time they leave their customers without power. Q: Can I plug a four-prong appliance into a three-prong outlet? A: New appliances are designed to meet the newest standards, so older appliances may not always fit new wiring and new appliances may not fit newer electrical wiring systems. Your electrical contractor can replace a new four-prong cord with a three-prong cord in existing installations. Talk with a local electrician about your specific needs. Q: Why are some of my outlets or lights working while others are not? A: There are several possible reasons for this, and only a licensed electrician can diagnose your specific problem. It may be that some of the outlets and/or lights are on a circuit that doesn’t work or is failing while other lights and outlets are on a working circuit. In this case, repairing the circuit can fix the problem. Another possibility is that the outlet or light switch has worn out and simply needs to be replaced. Electrical breakers also may have been tripped, and resetting the breakers may fix the lights and outlets. In any case, it’s best to call a local electrical contractor to diagnose and repair the problem. Q: My light fixtures are flickering, what should I do? A: Flickering lights can be a symptom of several problems. It could signal a loose connection in a circuit or a problem with the general electric supply. It’s best not to use the lights that are flickering (or any lights in your home or office if all of the lights are flickering) and call a licensed electrician to diagnose the problem immediately. Q: What causes residential lights to dim? A: Dimming lights are caused by several problems, which can only be accurately diagnosed and repaired by licensed electric contractors. If all of your lights dim, the problem may be at the local utility, the transformer or the service feed. Call your utility to check this first. If your lights dim when an appliance such as an air conditioner or refrigerator is turned on, the lights may be on the same circuit as the appliance and not receiving enough electricity when the appliance turns on. This can be repaired by putting appliances that draw a lot of electricity on a dedicated circuit. Dimming lights may also be a sign that your home wiring is too small or your power source isn’t strong enough. If your lights alternately dim and brighten, it could indicate a serious problem such as broken, loose or corroded wires. If this is the case, call an electrician right away to check your home wiring. Q: How can I lower my electric bill? A: The easiest way to save money on your electric bill is to monitor how often you use your heater, air conditioner, hot water heater and washer and dryer. These appliances use the most electricity and minimizing their use can greatly reduce your electric bill. Installing a programmable thermostat can help regulate your home’s temperature and cut down on wasted heating and cooling costs. Turning down your hot water heater or adding a programmable thermostat to it can help minimize hot water waste. And replacing old and broken appliances with higher efficiency appliances can save money every day. Talk with your electrician contractors for money-saving ideas that are specifically tailored to your home and energy usage.